Yay!!!! Thanks for your patience my lovely quilting friends! 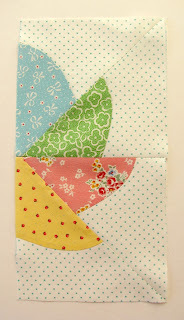 Here is the 7th installment of the Vintage Block Quilt Along! This block was referred to as "Pinwheel #7101" in the original pattern. 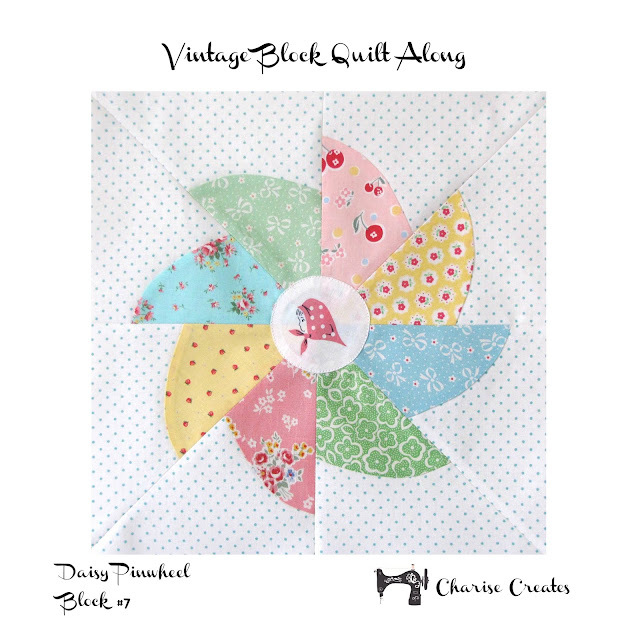 I have added Daisy to distinguish it from block #6 in the QAL which is also named "Pinwheel". This block is made from 4 identical squares. Each individual square is 6 ½”. There is lots of curved piecing involved in the construction of this block, but I have added matching marks (notches) to make it easier to construct! *Read through all the instructions before proceeding. 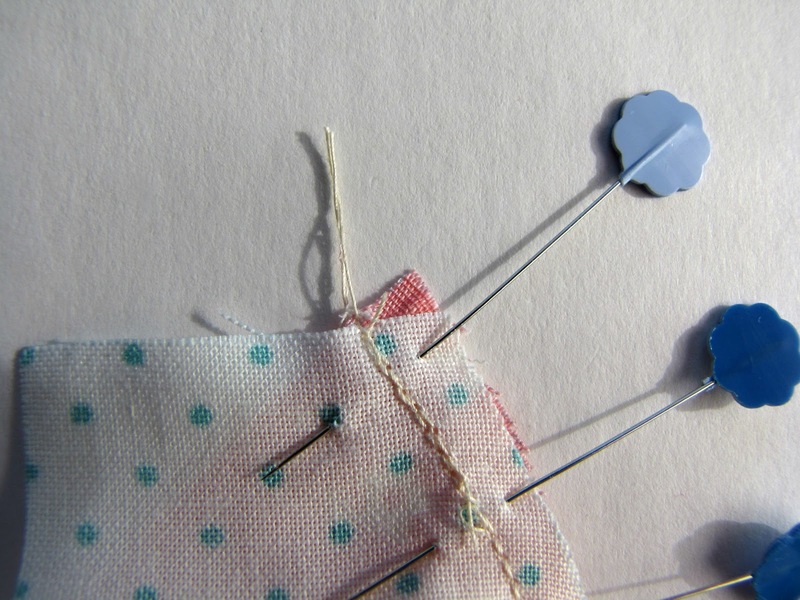 *Start with a sharp new sewing machine needle. *Cut the outside edge of the background fabric 1/8’ – ¼” so you have a little “wiggle room” when truing up your final block. With right sides together, match the notch on A1 and A2. Pin in place. Gently pull the background fabric edge to match the curved edge of A1. 2. 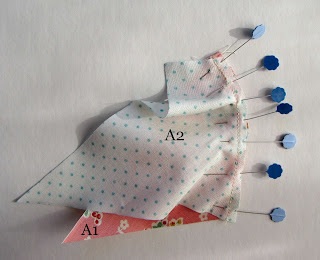 With the background piece A2 facing you, stitch with a ¼” seam allowance. 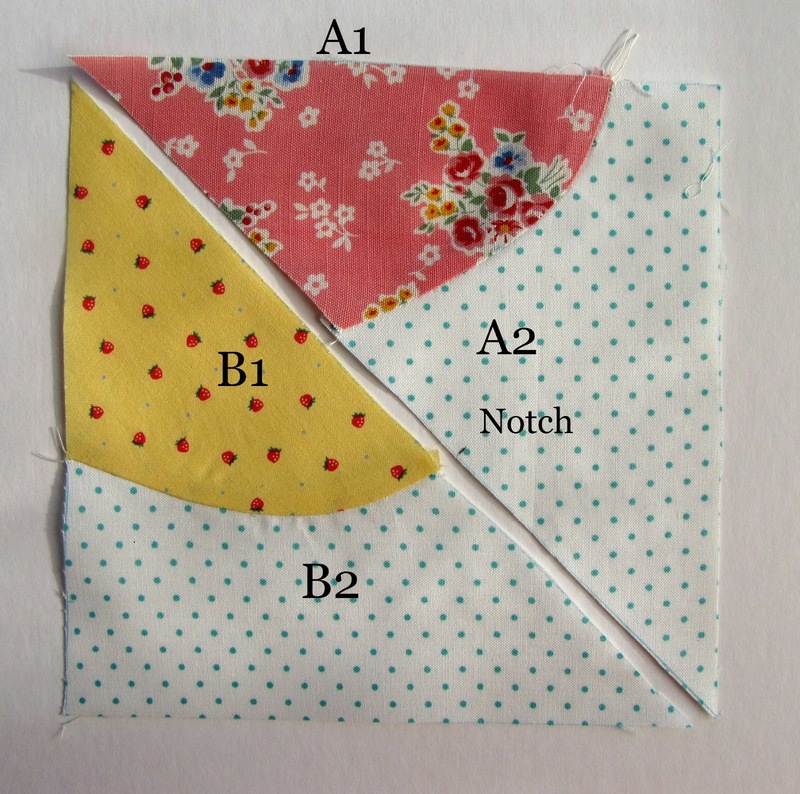 Press the seam allowance towards the center of the block. 4. 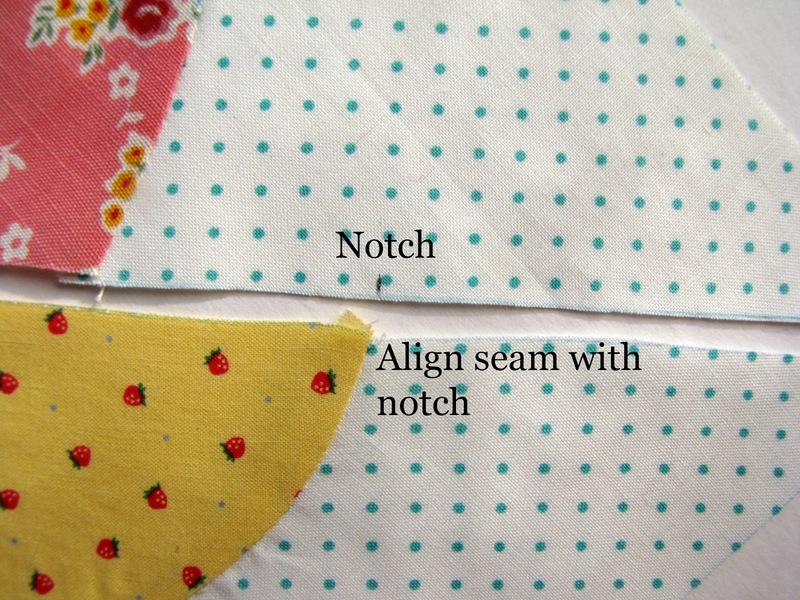 With the right sides together, match the notch on A2 to the seam on B2. Stitch in place. Press seam open. 5. Proceed for the other three sections. 6. With right sides together, match the raw edges and the notch. Stitch the top right section to the bottom right section. 7. 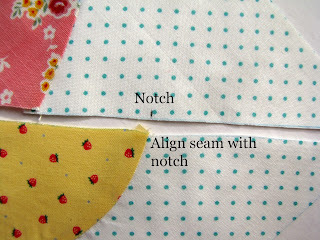 Stitch the right section to the left section matching seams. 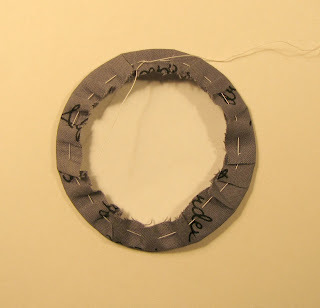 a) Iron the freezer paper circle to the center of the back fabric circle. b) Hand stitch a gathering stitch around the perimeter of the circle. c) Turn the fabric circle over and pull up the gathering stitch. Place a q-tip or small brush in the starch. Apply the starch to the seam allowance. Carefully iron the seam allowance over the edge of the freezer paper circle. 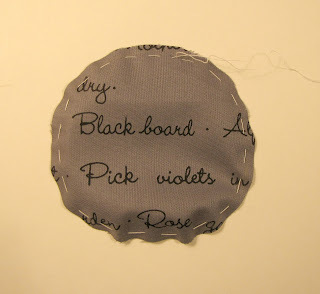 d) Loosen the gathering stitch and remove the freezer paper circle. You should have a perfect circle! e) Position the circle on the center of the block. Stitch in place with a machine edge stitch or by hand with an invisible stitch. Your block is adorable! Love the fabrics with that sweet centre! Really a very lovely block and a great addition to all the other blocks! I just love these blocks! Thanks for another awesome one! How sweet this block is! Love the kerchief girl in the center! Oh my I have just come across this! I love this idea! I really have to get things finished so I can start this QAL! Brilliant! In your "tips" you say "Cut the outside edge of the background fabric 1/8’ – ¼” so you have a little “wiggle room” when truing up your final block". Does this mean we should add an extra 1/8 - 1/4" to the outside edges of background pieces? I have been looking for the name of this pattern for years. No one has been able to tell me what it was. My Grandmother from North Dakota handmade a quilt with this pattern and it has been handed down to me and is well worn. I always wanted to make one out of my scraps as she did. I can see her dress, her apron, etc when I look at it. 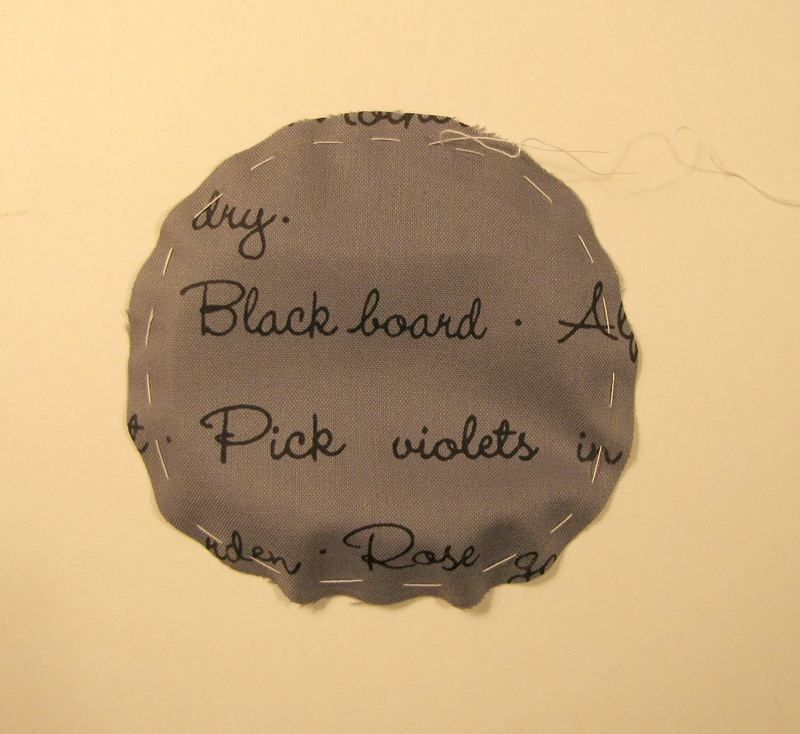 I've sewn quite a bit and have lots of scraps. My children and grandchildren can look at it and say, "I remember this".